There are many ways to celebrate a birthday. Around here, the kids usually get a weekend party of their choosing for their friends, and if the day of the actual birthday falls during the work week, a dinner out with the family on that day at a restaurant of their choosing. This time, it was my daughter choosing the party and the restaurant. And choose she did. Last year, we put on a big, themed party and did a ton of decorating and preparing. I spent a large number of hours working and preparing that party. This year, she wanted to do it all by herself. Well, almost all by herself. She wanted to plan the party. She wanted to decorate for the party. She wanted to bake her own cake. She wanted to plan the activities. She really wanted to do it. And it was the easiest party I have ever done. Oh. Easiest party that I have ever "not" done. 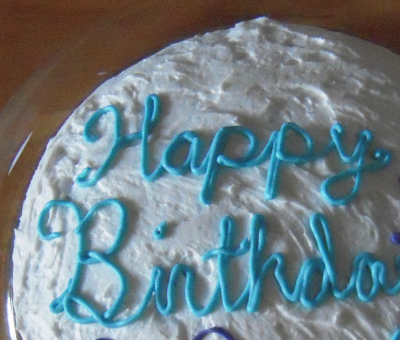 She baked the gluten-free cake, but we decorated it together. Her dad made her birthday (gluten-free) party dinner, with me assisting. She chose a birthday restaurant that has a gluten-free menu. I really don't think it could have been much easier on me. Huh. That feels weird. I don't know that I've ever not done much for a birthday party. Strange. But I'll take it! She loves the white cake we used in the trifle this summer. 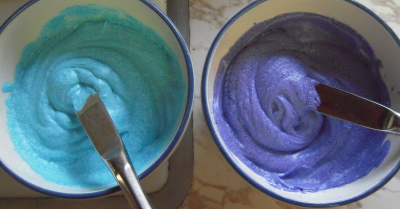 Now she wanted to use the same recipe to make her own birthday cake, except to double it. She also wanted to ice and decorate it. 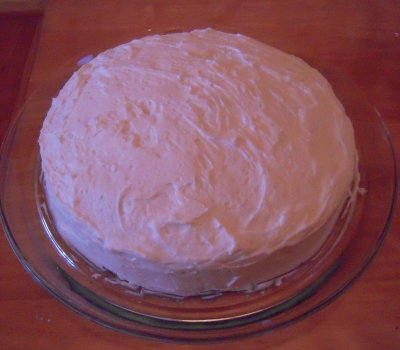 She made the buttercream icing and iced the cake. I mixed the colors for her. She loved how these turned out! I think they are nice. I wasn't quite sure she would be able to manage the piping cones to write "Happy Birthday," so I gently asked if I could do that part. She said I could, but she wanted to do the rest of the decorating, which meant curlycues. Yes, that less than stellar "Happy Birthday" at the top of the post is my doing. But at least I didn't misspell anything! She had a lot of fun adding colorful swirls and dots and curlycues to the cake after my words were done. She filled it with color and loved decorating it! She loves her dad's homemade, baked Macaroni and Cheese, and it just so happens to be gluten-free. She asked if she could have that and a green salad for her birthday party with her friends. "That's it? That's all you want for your dinner at your party?" "Yeah! 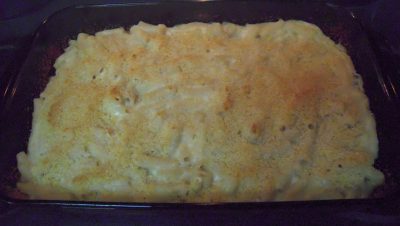 We all love baked macaroni and cheese and I know everyone will eat it!" Okay, babe, you got it. This recipe comes from an Italian cookbook, called "Italian" (imagine that!) by Carla Capalbo. This is not written as a gluten-free recipe, but we modified it to be. 1. Make a gluten-free béchamel sauce. Add part of the cheese and stir. 2. Cook gluten-free pasta. Drain. 3. Prepare ovenproof pan by greasing it and then sprinkling with gluten-free breadcrumbs. 4. Combine pasta with the sauce. Pour it into the prepared ovenproof dish. Sprinkle the top with the remaining breadcrumbs and grated cheese. Bake for 20 minutes. That's the gist of it. Here's the result. All of that browned cheese and breadcrumb deliciousness, just waiting for someone to love them! And love they got! Later in the week, on the actual day of her birthday, she wanted to eat out Italian. She loves the Italian restaurant Bertucci's and they just so happen to have a gluten-free menu. Hurray for me! 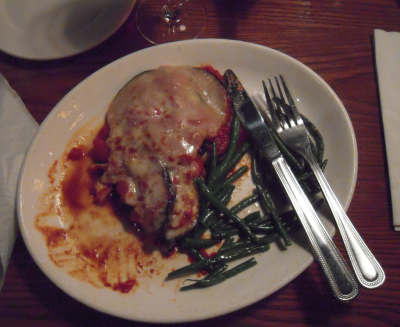 Here's my gluten-free Eggplant Parma. It was fabulous! And despite it being at an Italian restaurant with a brick oven, I have safely eaten there several times, gluten-free. As for my daughter's choices in food, does anybody see a trend here? Is she trying to please her mama every step of the way? Even if there is a trend, I'm sure she and her friends had a great time at her party. And I know she loved every minute of the planning and preparing. She spent weeks thinking and getting ideas and finding what she wanted and choosing a craft and planning every minute of their party time. She was so into all of it!